WE OFFER WHOLESALE CHRISTMAS TREE SALES ONLY. We are currently in a planting phase and will not have a harvest until 2021. Please Check back later! There are approximately 25-30 million real Christmas trees sold in the US every year. There are close to 350 million real Christmas trees currently growing on Christmas tree farms in the US alone, all planted by farmers. 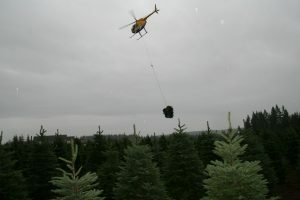 North American real Christmas trees are grown in all 50 states and Canada. Eighty percent of artificial trees worldwide are manufactured in China, according to the US Commerce Department. There are more than 4,000 local Christmas tree recycling programs throughout the US. There are about 350,000 acres in production for growing Christmas trees in the US; much of it preserving green space and preventing deforestation. There are close to 15,000 farms growing Christmas trees in the US, and over 100,000 people are employed full or part-time in the industry. It can take as many as 15 years to grow a tree of typical height (6 – 7 feet) or as little as 4 years, but the average growing time is 7 years. The top Christmas tree producing states are Oregon, North Carolina, Michigan, Pennsylvania, Wisconsin and Washington.